Browse: Home / Main / BTI’s Rants and Ramblings: Rick Stansbury Advocates for Kentucky College BBall Tournament, Thoughts? BTI’s Rants and Ramblings: Rick Stansbury Advocates for Kentucky College BBall Tournament, Thoughts? I am not sure how long the Rick Stansbury tenure is going to last at Western Kentucky, and as an alum, my red flags have been going up over the last couple years following the debacle that was Mitchell Robinson and the recent commit of a Top 10 player into this year’s class. There is nothing me, as a fan, can do about it but ride this new wave of elite players and hope for the best. But I am worried what will be at the end of this road. Nonetheless, Stansbury has begun to make WKU relevant again on the college basketball scene in this state and he is doing so with some brashness. With Pitino gone at Louisville, this state needs another “hold nothing back” coach and Stansbury might fill that void. Now, currently there are 7 Division-1 basketball programs in the state: UK, UL, WKU, EKU, Murray, Morehead, Northern. So how would you choose the 4th school would be an interesting decision but I would assume Murray would be considered the 4th best program in the state right now with NKU close behind. But either way, games against in-state competition is something I have always craved and wish happened more often. UK hasn’t played WKU in a non-tournament setting since 2002. They have only played Morehead State 4 times since 2000. They have NEVER played Murray State. So forcing some kind of event would be great. I think what you would need to see is something like they do with the Crossroads Classic in Indiana. Purdue, Notre Dame, Butler, and Indiana play a rotating series every year in Indianapolis. Since Purdue and Indiana are already conference opponents, they don’t play but instead rotate between playing the Irish and Bulldogs every other year. You could do that for this Kentucky series as well. Kentucky and Louisville don’t play as part of the series but rather rotate playing WKU and the other chosen school every year. Maybe you rotate who the 4th school is every 2 years? Either way, having the big boys play the smaller schools in the state is a wonderful idea. Replace Siena and Marist on the schedule and put a Murray State. The quality of opponent doesn’t change, thus no RPI damage. And the fans around the state are far more invested. Win-Win. 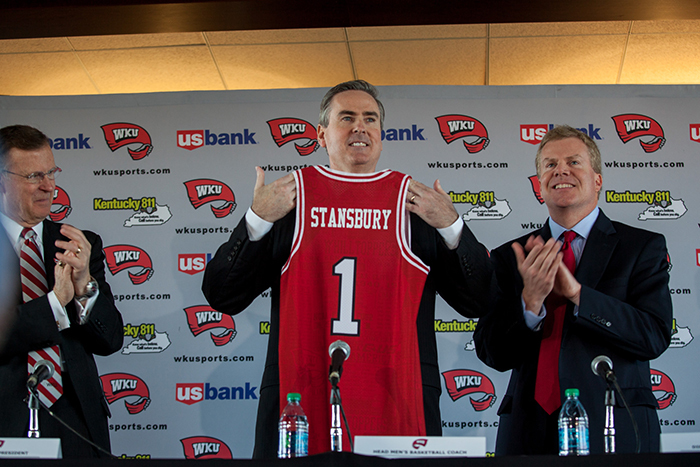 I hope Rick Stansbury doesn’t let this go and the schools he suggested can work together to make this happen. History shows us that probably won’t happen but I like the brashness of the coach in Bowling Green to say so. Simple: instead of playing four other teams in the Cawood Ledford or Adolph Rupp Classic (or whatever they call it now), play WKU, Murray, Northern, and Lou! One problem according to Rupp. If you win, big deal…if you lose, oh hell. Yep, I would personally like to see it; but, Rupp had a point. I can remember back when UK or UL both would have had a hard time beating Ky Wesleyan or Ky State. In fact, one year the NCAA extended a bid to Ky State for the big tournament, and Michigan threatened to pull out…they knew they couldn’t beat the Thoroughbreds…and NCAA pulled the bid. I would hate to see us go back to the days when we were afraid of losing. I say bring them on. I’m all for this…. rotate the 4th school every year and locations, great way to generate interest in the mid majors. I hope that western does get their wish. I think a tournament between WKU, Murray, Northern, Eastern & Morehead would be awesome. If UL wants to sign up, go for it. But I see no reason for UK to do this. We already play UL every year, we are not going to set up a situation where we might play UL twice in a season. So now you would have to replace the UL game with a tournament wherein UL and UK would be on opposite sides, and now you have a situation where one team could lose and now you end up not playing UL (the noly game anyone wants to see). Or you have a round robin style tournament with those teams, but that is not really a tournament if it does not take place at 1 location over a weekend, it is just a schedule. Now you get to the bones of this, basketball is a business and going to WKU, Murray, etc to play a game makes no sense. Why give up a home game? Nothing gained and money lost. I like this idea. Still play some mid-majors, but keep the money in the state. Match up 2 of the mid-majors for a play-in game and have UK and UofL host in alternating years. Now, somebody contact BTI and let him know his account has been hacked by someone with common sense. Or maybe let UK and UofL host every year at Rupp and Yum! and still keep the regular UK/UofL schedule. Do you do this and just let the top two programs (UL/UK) alternate WKU and Murray St. every other year and still keep UK/UL home’n’home like it is today? Why not alternate sites as well and play it in Rupp one year and YUM! the next year? Years ago, it was UL/UK vs IU/ND which was great!! UL a top program? Pump the brakes. Only two titles all-time and less wins than WKU. I think wonderful idea is a bit too strong 🙂 . As long as Cal is the coach, I think he prefers to keep all his options open so locking into something like a tournament approach seems doubtful. Since most schools treat a game with UK as a season highlight, I think motivated competition can be provided regardless of in-state / out-of-state. I think getting another KY school in addition to UL on the schedule does provide help to that school as long as it doesn’t turn into another opportunity where graduates from in-state universities treat each other poorly just because of the school they attended. Do a 2 day classic where all the games are in Momerial. Louisville v Bellermine 5 pm tip day 1; KY vs Transylvania 5 pm tip day 2; Murray v Morehead 8pm tip day 1; WKU v EKU 8pm tip day 2. Win/Win for KY! It would be a cool event and all the teams and KY basketball traditions can be celebrated at start of college basketball season. I’ve been advocating for something like this but instead of being UK, UofL, WKU, and Murray/Morehead/Northern, something like UK, UofL, Cincinatti, and Xavier. Cincy/Xavier and UK/UofL already play every year but we could rotate the other two opponents (i.e. UK/Cincy & UofL/Xavier followed by UK/Xavier & UofL/Cincy). Just what KY needs, two thug programs to play. No thanks, I wouldn’t give either an opportunity. Neither deserve it. Bryan, your allegiance to your alma mater is showing. Nothing wrong with that. But WKU’s success on the hardwood is cyclical, depending on their coach. I do think your suggestion overall has great merit. Historically, UK and Louisville are the only two teams who have stood the test of time. I would suggest that the third team in would be whichever one is hot at the time and rotating the fourth team. If no team is hot, then rotate both teams. While this scenario might be a bit unwieldy, I believe it is doable and would be more fair to the other teams in the state. It’s a decent idea but who cares about WKU. Get UK, UofL, Cincy and Xavier; call it the triangle of death. Have UK v UofL, Cincy v Xavier, then the winners play each other and loser play each other.